We are a small club offering domestic dog obedience classes and agility training classes. Our club grounds are at McKinnon Park, on the corner of Taylor St and Swayne Rd, Cambridge (by Cambridge High School). 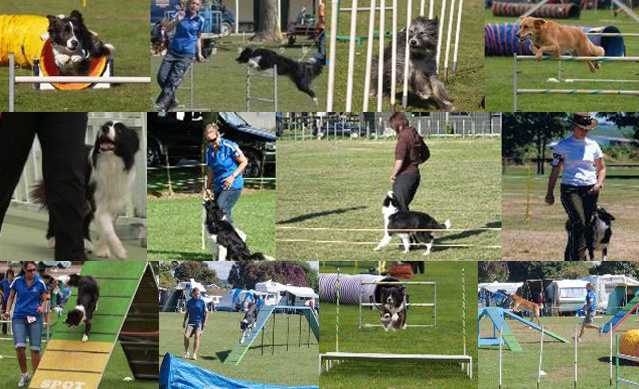 We have active club members competing in both agility and obedience. 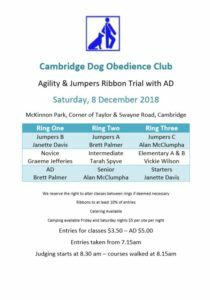 *UPDATE* – Click the flyer below to see the information for our upcoming Agility and Jumpers Ribbon Trial with AD. Agility classes are on Tuesday nights and run for ten weeks. Domestic class training nights depend on the instructor, and these classes run for eight weeks in Cambridge. See classes and training page for more information and for term dates. Club members are welcome to join our facebook page where we can discuss, view and share ideas, thoughts, photos, links and other things. A huge thank you to our wonderful sponsors, Superior Chunky (aka FondFoods).